Dinosaur bone engagement ring handcrafted in sterling silver by Hileman Silver Jewelry. This impressive dinosaur bone engagement ring is 6.2mm wide at the top and tapers down to 4mm at the bottom of the shank. The ring has 3 sections of fossilized dinosaur bone inlaid on each side of a Forever Brilliant Moissanite set in the center of the ring. The .68 carat round moissanite is set almost flush, giving the engagement ring a sleek low profile. Moissanite is a laboratory created gemstone with more brilliance than a diamond and is almost as hard. It is an affordable and conflict free alternative to a diamond without sacrificing beauty or durability. The moissanite comes with a limited lifetime warranty and certificate of authenticity from Charles and Colvard. 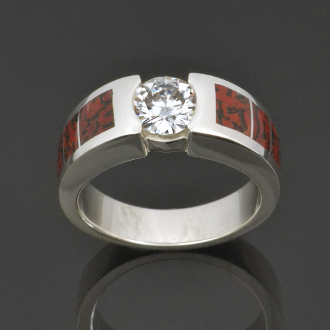 The fossilized dinosaur bone we used in this engagement ring is usually referred to as “gembone”. It is actually not bone but is a combination of minerals that have replaced the bone over time (similar to how petrified wood is formed). Dinosaur bone is found in a rainbow of colors with the webbing color and cell size varying greatly from piece to piece. The varying cell size and colors creates some truly unique patterns and virtually one of a kind pieces of jewelry. Fossilized dinosaur bone can be composed of many different minerals including agate, jasper and calcite. The dinosaur bone color is determined by the combination of minerals present when the fossilized bone formed. This ring will be made to order in your ring size in 4 to 6 weeks, so please schedule your order to allow us plenty of time to create your ring and ship it to you.